Factors obstructing the adoption of crowdsourcing, social media, and digital volunteerism approaches often include uncertainty about accuracy, fear of liability, inability to translate research into operational decision-making, and policy limitations on gathering and managing data. Prior to the workshop, many in the formal response community assumed that such obstructions are insurmountable and, therefore, that the approaches could not be adopted by the response community. However, it became clear during the workshop that these approaches are already being integrated into disaster response strategies at various scales. From federal agencies to local emergency managers, officials have begun exploring the potential of the technologies available. Stories of success and failure were common, but out of both came policy, research, and technological implications. Panelists shared strategies to overcome barriers where it is appropriate, but resisted change in areas where policy barriers serve a meaningful purpose in the new technological environment. Determining where government agencies can effectively leverage social networking, crowdsourcing, and other innovations to augment existing information or intelligence and improve decision-making (and determining where it is not appropriate). One thing noted in the NPR piece was the importance social media played in providing information from the scene. 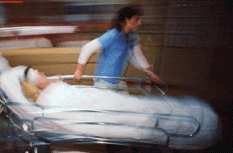 When the bombing happened staffers at some Boston hospitals found out about the event when they saw Tweets alerting them to tragedy from doctors positioned at the finish line. This had an impact–for instance, at Mass General an anesthesiologist suggested immediately stopping all elective surgeries. The report, “Twitter as a Sentinel in Emergency Situations: Lessons from the Boston Marathon Explosions, was referenced by the NPR host in which researchers found that Tweets sent from the scene appeared 6 full minutes before hospitals were notified by Public Health Officials. This information has left some hospitals asking: Can we use social media more effectively? One piece of irony: the Brigham and Women’s Hospital received exactly 23 patients. Social Pressure: Can it work for Disaster Preparedness? In this post I examine what social media, emergency preparedness and get-out the vote messaging have in common–it seems like a stretch, I know! 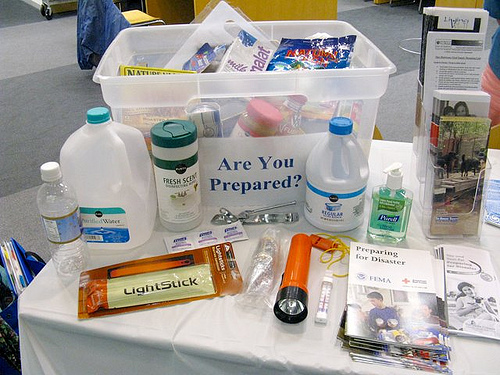 Every September is National Preparedness Month and the typical information campaign revolves around getting people to understand their risks, make a plan, and get a kit. But, measuring whether or not people have actually changed their behavior is the tricky part. On October 1 how will we know if people are more prepared for the hazards they face? In terms of benchmarks, an often cited American Red Cross survey in 2008 found that only one in ten American households had accomplished these tasks. Research in this area also reveals interesting demographics regarding who is more likely to take these steps (e.g. homeowners vs renters, older adults vs those younger than 34, etc.) and why people prepare or not. There are many barriers to disaster preparedness, each with implications for messaging, but it is somewhat common knowledge that risk perception is dependent upon both how the information is communicated (Mileti and Sorensen, 1990) and how it is interpreted through social interactions (Kirschenbaum, 1992). Can Information Shared on Social Networks Influence Behavior? If the County does not reach their goal of 100 supporters then the message is not delivered–at least not on this platform. Talk about an incentive structure! The tool can be a bit confusing. I had to read and re-read what they wanted me to do until I finally realized that I didn’t have to post–that it would be done for me. Although I had no problem with them posting on my behalf, this might cause concern for others. Making a pledge to do a preparedness activity is not the same as actually doing the deed, so although this platform is quite cool–it does not eliminate the problem of actually measuring behavior change, other methods have to used for that purpose. The impact of Fairfax County’s Thunderclap might not be known anytime soon, however, quantitative analysis of the 2012 “I voted” virtual campaign does speak to the potential significance. The first large-scale experimental research on the political influence of social networks finds that Facebook quadruples the power of get-out-the-vote messages. While the single-message study produced a moderately successful boost in turnout (a 2.2% increase in verified votes), the most important finding was that 80% of the study’s impact came from “social contagion,” users sharing messages with friends who would otherwise never have seen it. This is the first definitive proof that social networks, as opposed to television or radio, have uniquely powerful political benefits. Published in the latest edition of the prestigious science journal, Nature, the 61 million participant study randomly assigned all Facebook users over 18-years-old to see an “I Voted” counter at the top of their newsfeed with the number of total users who had voted on Nov 2nd, which had a link for more information about local polling places. Turnout was verified from a database of public voting records. Interestingly, the 3-pronged experiment displayed two types of “I Voted” messages, one with pictures of friends underneath and one without. Those who did not see pictures of their friends were barely affected by the message at all, “which raises doubts about the effectiveness of information-only appeals to vote in this context,” surmise the authors. Although voting is a somewhat easier task than doing 30 separate preparedness activities, this research does shed some light on how social sharing can help influence desirable behaviors. Let’s hope people will see these posts and think–I should do that too. Best case, they actually do! Curious about the best use of crowdsourcing? Read this report. At the Federal level, however, crowdsourcing is not only familiar–it has recently been embraced very publicly by FEMA. For instance, they used the power of the crowd during the aftermath of Hurricane Sandy to help review images of damage. Just this summer, FEMA added a new feature to their mobile application that also is considered crowdsourcing. The app includes the ability for people to submit images of damage, which are then aggregated and placed on a publicly available map. Their efforts have received quite a lot of media attention–see: FEMA App Adds Crowdsourcing for Disaster Relief. Below is their summary. 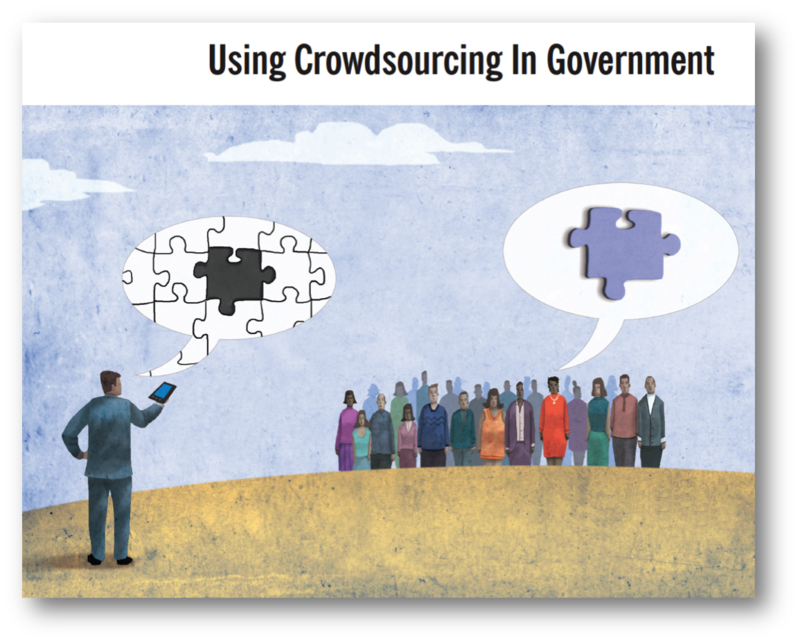 You can downloaded the report here: Using Crowdsourcing In Government. The growing interest in “engaging the crowd” to identify or develop innovative solutions to public problems has been inspired by similar efforts in the commercial world. There, crowdsourcing has been successfully used to design innovative consumer products or solve complex scientific problems, ranging from custom-designed T-shirts to mapping genetic DNA strands. Type 1: Knowledge Discovery and Management. Collecting knowledge reported by an on-line community, such as the reporting of earth tremors or potholes to a central source. Type 2: Distributed Human Intelligence Tasking. Distributing “micro-tasks” that require human intelligence to solve, such as transcribing handwritten historical documents into electronic files. Type 4: Peer-Vetted Creative Production. Creating peer-vetted solutions, where an on-line community both proposes possible solutions and is empowered to collectively choose among the solutions. By understanding the different types, which require different approaches, public managers will have a better chance of success. Dr. Brabham focuses on the strategic design process rather than on the specific technical tools that can be used for crowdsourcing. He sets forth ten emerging best practices for implementing a crowdsourcing initiative. What do you think? Is your organization interested in using crowdsourcing anytime soon? Which category would best fit your desired objectives? “Coordinated” is the key word in that definition, but a description of what should happen and what actually occurs are often two vastly different things. There is, however, a great example of what a well-coordinated ESF #15 effort can look like: the external affairs effort around the “Big Windy Complex” forest fires in Oregon. How are they doing it? 1. Social Presence is not branded with any particular agency. The external affairs teams providing and updating information about the Big Windy Complex Fire seem to be operating under the mantra “It’s not about us.” Instead of branding information with a particular Incident Management Team, local emergency management or law enforcement agency, or even the Virtual Operations Support Team that’s assisting with this effort, the name of the fire gets top billing. By branding the fire under an event-name versus an organization’s name members of the ESF #15 team can post consistently across the life-span of the fire. The public doesn’t care WHO is posting, they care WHAT is posted. 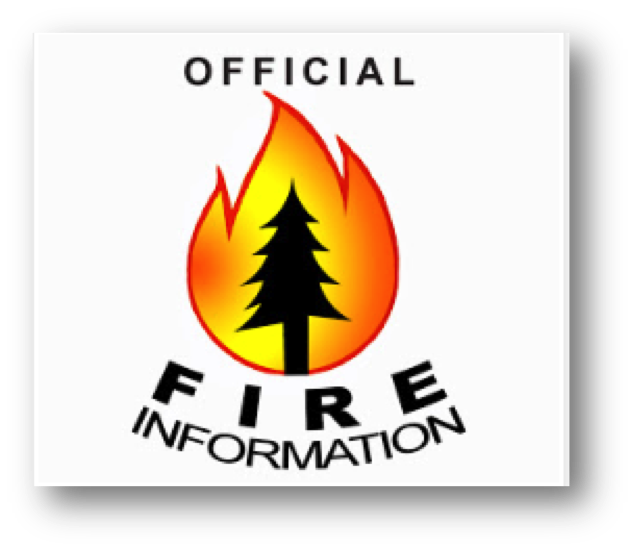 The Big Windy Complex blog site mimics the Inciweb standard of listing all “cooperators” on the fire response and recovery effort. The cooperators include local and state entities, as well as Federal agencies such as the Bureau of Land Management and the USDA Forest Service. 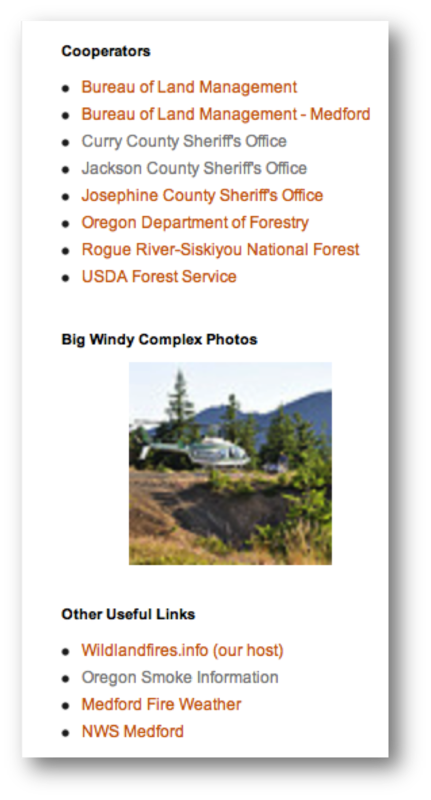 These agencies are hyperlinked along with “Other Useful Links” such as the “Oregon Smoke Information” site. This is a very visible demonstration of cooperation that implies content endorsement. I think it is key to gaining trust from the public–they might not know anyone who works for the USDA, but they probably know their local Sheriff. Although no questions were posted to this particular entry, it is also apparent from perusing the Facebook page that questions from the public are answered in a timely manner. Does the Public Respond Favorably? Although some emergency management work is thankless, social media provides the opportunity for the public to show their gratitude. It is not uncommon after an event to receive an outpouring of public appreciation, and that is true for the Big Windy Complex event as well. The comment below was posted to the Facebook page and demonstrates that they are clearly reaching the target audience. I just want to say thank you for this page and all the updates that have been provided. Never once in a million years did I think I would follow Twitter updates and a Facebook page for a wildfire. This is the first first fire my son has ever been on, and although those first several days I was a nervous mom, I can say the updates continually calmed my nerves. The updates are very telling of the management overseeing the fire; the concern for safety, and the desire to communicate to those who are impacted by this fire, whether near or far, directly or indirectly. Thank you, it is very much appreciated. I agree! 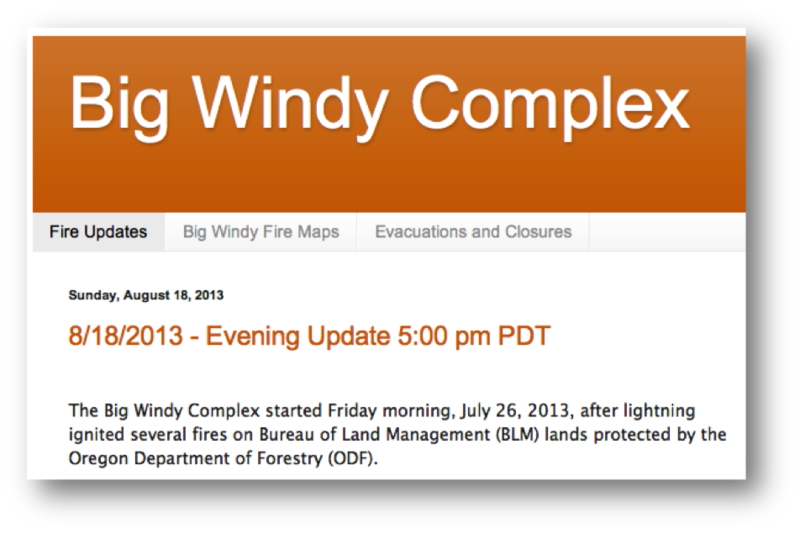 Thank you to the folks working on the Big Windy Complex fire for providing such as great case study. Go #VOSTies! The Seattle PD Twitter account was not on my radar, however, the Tweet above caught my attention. When I saw the words “malicious rumor” I thought I’d found a great example of rumor management. The Hemp Fest is a large event that attracts cannabis lovers and activist from far and wide. I thought to myself, “Who would suggest a Police Department would attend and give out snacks? That rumor should be squashed immediately!” As I read through their Twitter feed, however, I realized the rumor that they would be giving out Bugles was a malicious untruth because, in fact, they will be handing out Doritos! Their munchie-Tweets have attracted national media attention, but this campaign isn’t the only reason their social presence makes a great case study. With over 40,000 followers, they are clearly doing something right. Here are three things stand out about their social media strategy. @MissJessss Nothing criminal currently. An issue with a bus that might've caused some injuries. But although these exchanges make for a strange read, they also demonstrate willingness to engage the community. With each query they answer a bond of trust is built; people that aren’t asking questions can also see that this account is a “go-to” source for information. In contrast, if an agency simply pushes out messages the public may or may not be interested in, they miss that opportunity. By using humor their message about the changes to the marijuana law is getting to the people who need to hear it in a way that is not off-putting. Although it has been widely successful thus far–I’m guessing there were debates about whether or not this was a brilliant idea or a career-ending endeavor. The campaign also demonstrates the trust the leadership has in the outreach coordinator, which infused humor even before this very visible effort. In fact, to have a truly impactful social media presence the involvement and buy-in of leadership cannot be understated. A handy list of all of their Twitter feeds can be viewed here: http://www.seattle.gov/police/tweets/feeds.htm. Unlike the Toronto PD, these “beat” accounts are not personalized with the officer’s names and images, instead a naming convention has been used such as “Seattle Police Department Beat 1” or: @SeattePDB1. The Tweets from these accounts read a lot like a police blotter (see below) nonetheless, they still provide an opportunity for the public to see what actions the police are taking, and can help stop rumors from starting. What do you think? Would your law enforcement or emergency management agency be open to Tweeting potentially controversial material in order to gain an audience and engage the public? From my perspective, it is time for more organizations to get creative! FEMA consumed the majority of the Social Media and Emergency Management conversation on Twitter yesterday with their announcement of an update to their mobile application allowing people to post images of damage after a disaster: read more on Mashable. Another interesting development–yet, much less discussed–was the announcement of their new “Social Hub” a feature on the FEMA mobile website. The Social Hub, as indicated by FEMA staff member Jason Lindy, pulls in Tweets from official or trusted sources and organizes them by topic. The site can be viewed on the desktop but has a better user experience on a mobile device, the intended platform. 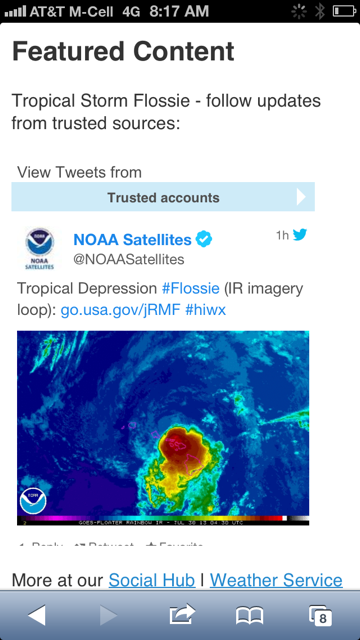 This new feature is a great addition to FEMA’s social presence since it allows for a “one-stop shop” of information from all response partners (see the screen capture on the right). I think it is also a visual demonstration of how each organization and government agency should continue to post content relevant to their “lane” to the audience they have already built. The “Social Hub” aggregates that content and literally puts everyone on the same page. The site can also help community members find relevant voices: when viewing the content they will clearly see information provided not only by FEMA headquarters and regional offices, but probably even more importantly, from local officials. FEMA is not the only organization that has realized the value of having a Social Hub. The National Capital Region also has a News and Information Page that provides a similar feature–including alerts from partner agencies throughout the region. 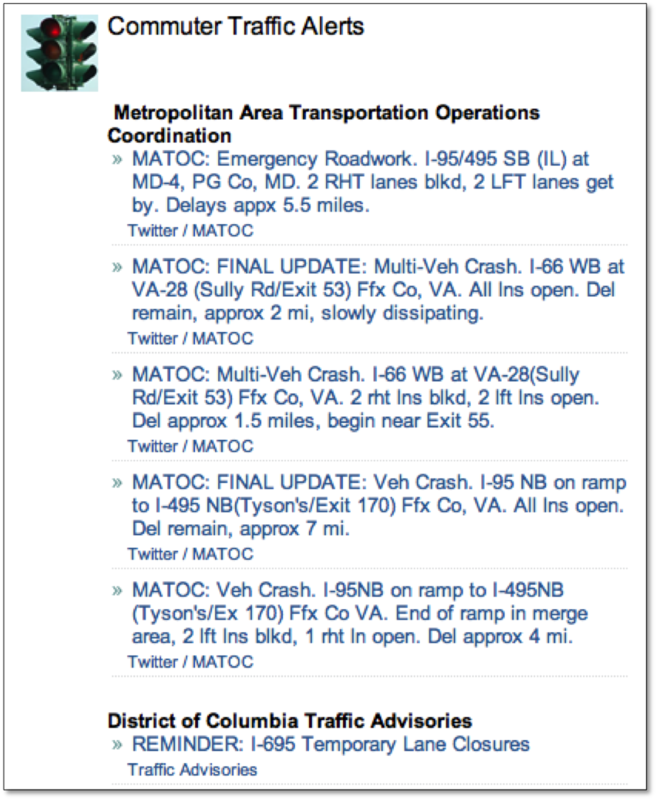 The page highlights and provides links to four main content areas: Emergency Alerts, Weather, Traffic, and Utility information. By building the page they recognize that the public might not define “emergency” the same way that Emergency Management officials do. Large traffic incidents, poor road conditions and bad weather can be an emergency for an individual. Another great feature is that the links are not simply provided but the content is pulled into the site, also making it a one-stop shop for information. Although the public can view official content directly on social networks by sorting information based on key words–I think these aggregated pages provide a valuable service. If you know of any similar sites, let me know!